YOU PROBABLY NEVER WOULD HAVE THOUGHT OF MONGOLIA AS A PLACE TO TAKE A VACATION IN, OR EVEN GO ON A LIFE-CHANGING MOUNTAINEERING TRIP, BUT YOU WOULD BE SO WRONG. THIS HUGE, MAGNIFICENT, STILL UNDISCOVERED COUNTRY HAS SO MUCH TO OFFER; WIDE OPEN SPACES, HIGH MOUNTAINS, HUGE DESERTS AND AMAZING HISTORY. THIS IS ALSO ONE OF THE SAFEST COUNTRIES TO VISIT, BUT AN OUTDOOR ADVENTURE IS GUARANTEED. Take a look at our list of 17 Interesting Facts about Mongolia, followed by more information about the mountains and adventures that await. 1. Today’s country of Mongolia is actually historically the Outer Mongolia, while the Inner Mongolia is still part of China. During the Outer Mongolian Revolution of 1911, Outer Mongolia declared its independence from the Chinese Qing Dynasty. 2. The Great Wall of China was actually built in Inner Mongolia in the 6th century AD. 3. Mongolia is a huge country, second largest land-locked country in the world, right after Kazakhstan. It is also the most sparsely populated country in the world, with only 4.3 people per square mile. 4. The Gobi desert is the largest desert in Asia, and the fifth largest in the world, but apart from the region called “Singing Dunes”, it doesn’t look like a desert at all. Instead of sand, here you’ll find barren rocky wilderness, and if you’re lucky you may even see an exposed dinosaur fossil. 5. Mongolia is one of the highest countries in the world. Its average elevation is 1580m (5182ft). 6. The capital of Mongolia is Ulaanbaatar, or Ulan Bator (Mongolian Ulayanbayatur - “Red Hero”). It was founded in 1639 and changed its location 28 times before settling at its present location in 1778. Being in a landlocked country with high elevation and high latitude, and experiencing the effects of the Siberian anticyclone, Ulan Bator is the coldest capital in the world, with average temperature of -1.3 degree Celsius. 7. Karakorum (not Karakoram), was the capital of the Mongol Empire in the 13th century. Today, its ruins lie in the Övörkhangai Province of Mongolia, near today's town of Kharkhorin, and adjacent to the Erdene Zuu monastery – the oldest surviving Buddhist monastery in Mongolia. Both are part of the World Heritage Site Orkhon Valley Cultural Landscape. 8. Mongolia has three mountain chains: the Khangai Mountains, the Khentii Mountains and the Mongolian Altai Mountains. The Khüiten peak at 4374 m (14,350 ft) is the highest point in the country, and it’s part of the Altai Mountains range, right on the border with China. It was known in the past as “The Friendship Peak”, but some sources associate this name with another peak, 2.5km to the north of Khüiten Peak, which marks the border tripoint between Russia, Mongolia, and China. The first known ascent of the mountain was sponsored by Mongolian government in 1963. 9. The longest glacier in Mongolia is The Potanin Glacier, 14km long and located in the Altai Mountains Range. 10. Mongolia is famous for the nomadic lifestyle – around 30-40% of Mongolians still live as herdsmen, farming camels and horses, and constantly moving around the country finding the best conditions. 11. These nomads usually live in tents, the traditional gers, also known as “yurts”. These portable homes were traditionally used by nomads in the steppes of Central Asia. The door of the ger is always facing south because the wind blows mostly from North and Northwest. Scattered in the desert, ger is sometimes referred to as the White Pearl of the Steppe. 12. Mongolian horse breed is still unchanged from the times of Genghis Khan! 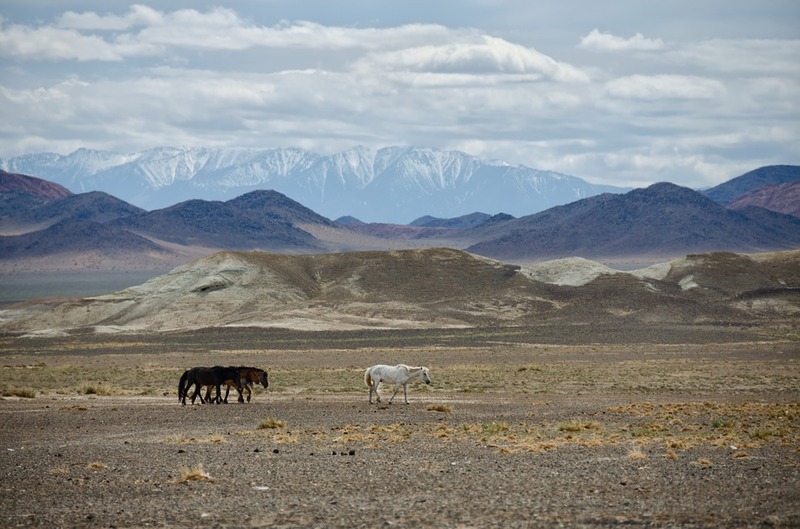 Today, there are over 3 million horses held by the nomads, outnumbering human population. Horse riding is a crucial part of the nomadic lifestyle of Mongolians: “A Mongolian without a horse is like a bird without wings”. They were also a key factor in the 13th-century conquests of the Mongol Empire. Mongolian wild horses are considered the last truly “wild” horses as they have never been domesticated. 13. Mongolian throat singing, or Khoomei, is a type of overtone singing, which is practiced by the people in Mongolia. The singer produces one fundamental pitch and then, simultaneously, one or more pitches over it. This type of singing gives the impression of the wind swirling among the rocks. 14. Genghis Khan, famous Mongolian warlord, was voted one of Time magazine’s “25 Most Important Political Icons of All Time” in 2011. He formed the Mongol Empire in 1206, the largest contiguous empire in world history which covered 22% of the Earth’s total land area. At the time of his death, Mongolian Empire stretched from Beijing to the Caspian Sea. 15. Geneticists began tracing a variant of the Y chromosome (transmitted only through the male line), and found that estimated 17 million Central Asian Males are the descendants of Genghis Khan! 16. Deer stones, or Reindeer Stones, are mysterious ancient megaliths scattered across Mongolia and some parts of Siberia. They all have carved depictions of flying reindeers. They’re were probably erected and carved by the Bronze Age nomads (around 1000 BC) but nobody knows their purpose. 17. Bactrian camel is native to Mongolia and it has two humps! It’s much rarer than its one-humped cousin; its population of 2 million exists mainly in the domesticated form.